Kia ora and haere mai, welcome to the 32nd instalment of 9mm for 2018, and the 204th overall edition of our long-running author interview series. 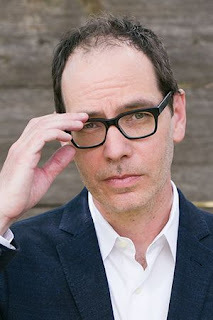 Today I'm very pleased to welcome award-winning American crime writer Lou Berney to Crime Watch. I met Lou at Bouchercon in Toronto last year. He is one of those writers who I hadn't yet met or interviewed but had heard amazing things about. His novel THE LONG AND FARAWAY GONE had achieved the extremely rare feat of sweeping the prestigious Edgar, Anthony, Barry, and Macavity Awards in the United States. He's a stylish writer that other top crime writers rave about. That praise has ratcheted up even further notches ahead of the upcoming release of NOVEMBER ROAD. Set against the assassination of President John F Kennedy, it's described as a "poignant and evocative crime tale that centres on a desperate chase across 1960s America - a story of unexpected connections, daring possibilities and the hope of second chances". Early reviews are glowing, and some crime writers who I've met and hold in the absolute highest regard are really raving about how special this book is. Given the high bar Lou set with THE LONG AND FARAWAY GONE, that's some praise. The great Don Winslow has called it "a staggeringly brilliant book", while Laura Lippman says Lou has become one of the genres stand-outs. NOVEMBER ROAD is a must-add to your TBR pile if you love really terrific crime writing. I've been saving it for after Bloody Scotland and other recent judging and features commitments, and am really, really looking forward to the read. When he's not putting out sublime crime tales, Lou teaches in the MFA program at Oklahoma City University. But for now, Lou Berney becomes the latest author to stare down the barrel of 9mm. That’s a tough question, but if forced to pick I’d probably go with Kate Atkinson’s detective, Jackson Brodie. I also love Patricia Highsmith’s Tom Ripley, though I understand I’m stretching the definition of hero a bit. My two older sisters were very influential when it came to my early reading – ie, they told me what to read or else. I remember being fascinated by The Happy Hollisters series, novels about a crime-solving family of kids who went to a different exotic location each book. I think my love of crime-writing and travel both started there. I wrote and published several short stories when I was in graduate school, but discovered I’m too long-winded for that form. Before I turned to novels, I worked as a professional screenwriter. That was challenging but rewarding. I learned a lot of stuff about plot and structure that comes in handy with my novels. My hometown, Oklahoma City, has some of the best Vietnamese food in the country, believe it or not. My life would make a pretty dull movie, thank goodness, and I have no idea who would play me. Someone told me once that I kind of look like Guy Pierce, which is not true but I’m going with it. The one I just finished is always my favorite. The one I’m just starting is always my least favorite. At Bouchercon in St. Louis, I was on a panel with my friend (and superb thriller novelist) Chris Holm. He was talking about his fear of bugs when, suddenly, a GIGANTIC cockroach fell from the ceiling and landed on the table right in front of me. I reacted calmly by freaking out and slapping the cockroach away from me and into the audience. I still feel bad about that. I should have fallen on the grenade. You can read more about Lou Berney and his books at his website, and follow him on Twitter.